The Nigeria Customs Service, NCS, has seized a truck carrying a container loaded with 661 pieces of pump action rifles. The truck with registration number BDG 265 XG conveying the 1x40ft container with Number: PONU/825914/3 was intercepted along Mile 2 on the Apapa-Oshodi expressway in Lagos. Briefing newsmen in Lagos, yesterday, the Comptroller-General, NCS, Col. Hameed Ali (retd) disclosed that the rifles were concealed in steel doors and other goods in the container. Ali said that the Roving Team of the NCS Federal Operations Unit, FOU, while on patrol, intercepted the Mack truck conveying the container stocked with the rifles and it was taken to the premises of FOU Zone A, Ikeja, Lagos. He said physical examination revealed 49 boxes containing the rifles, while three suspects have been arrested in connection with the illegal importation. Photos: Customs seizes container of 49 boxes containing 661 Ak 47 rifles in Lagos He said, “On January 22, 2017, the Roving Team of the NCS Federal Operations Unit, while on information patrol, intercepted a Mack truck with registration number, BDG 265 XG, conveying a 1x40ft container with Number: PONU/825914/3, along Mile 2 Apapa express road. 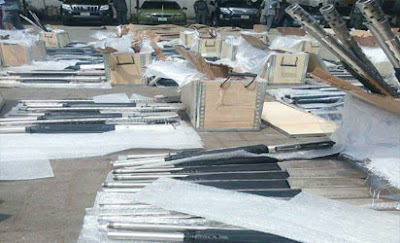 Apparently referencing the situation where the consignment had already been cleared at the port by Customs, Ali said: “Already, the officers involved in the clearance of this container are with the Comptroller FOU Zone ‘A’ Ikeja.” Several cases of interception of illegal arms have been effected by NCS both at port of entry and on transit within the country, with some maritime observers hinting that many of such illegal consignments have also escaped into the country through both land borders and sea ports. The deluge of the arms trafficking has been attributed to the fall out of regional arms conflicts in West Africa and Lybia, where weapons used in the armed struggles end up in other countries such as Nigeria with rising cases of violent crime.